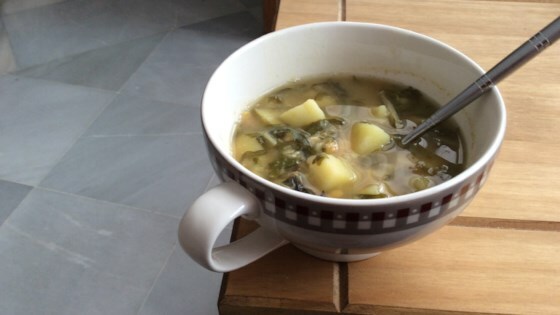 "Easy to prepare super delicious vegetarian soup." Bring water to a boil in a large pot. Cook lentils in boiling water until beginning to soften, 8 to 10 minutes. Add chard; continue cooking until wilted, about 5 minutes. Add potatoes to the boiling water, reduce heat to medium-low, cover the pot, and cook until the potatoes are completely cooked, about 12 minutes. Mix lemon juice, crushed garlic, and salt together in a bowl; add to the pot. Continue to cook at a simmer another 5 minutes. Stir olive oil into the mixture. Increase heat to high and cook another 1 to 2 minutes. Taste the soup while cooking and tune the garlic, salt, and lemon juice according to taste. If Swiss chard is not available, you can substitute with collard greens. little too much lemon and I will add cumin next time but delicious!!!!! Wow! So good. Do not add cumin. Decrease the lemon to 3/4 cup. Has a great lemony flavor.